Michael Antonelli is a Managing Director and equity sales trader at Baird, where he covers International clients. Prior to joining Baird in 2007, he worked in derivative sales at Fimat, a division of Societe Generale. 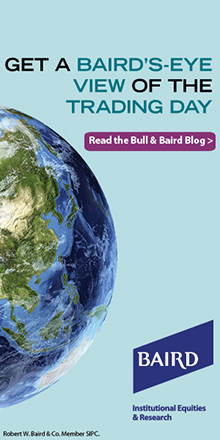 In 2013, Michael launched “Bull and Baird,” a market blog that explores catalysts moving the day’s financial markets, shares links to relevant news stories and editorials, provides market perspective and offers comic relief on the day’s developments. Michael received an MBA in analytic finance from the University of Chicago Booth School of Business and is a graduate of Purdue University.